You will notice the title is not a question. For many, there is no question. The lives of most church members make that statement each Sunday morning. Recently, I posted a couple of articles that addressed the issue of “church attendance” on my Facebook page and I found it interesting that both garnered similar responses. The first article, A Plea to Pastors: Don’t Cancel Church on Christmas, asked pastors to open their church on Christmas Day. If you recall, Christmas 2016 fell on a Sunday. Posting the article seemed harmless enough and the topic . . . a no-brainer. On a day that celebrates the birth of our Savior, open the church for people to worship him. The second article (posted by me in Feb. 2017) entitled, Southern Baptists, An Unregenerate Denomination, examined the disparity between church membership and church attendance (See below – links to both articles). 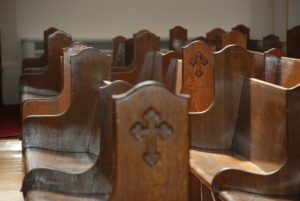 In short, the second article draws the conclusion that the lack of regular church attendance by members is indicative of an unregenerate church. What I found interesting is that responses to both articles brought up the same word of hesitation by readers . . . legalism. Legalism!!! Hmmmm. Is it legalistic to call for and expect the body of believers to say “No,” to the world on Sundays and attend church? Before we address that question, let me just give you a taste of the second article, which I will reference several times. Christmas has come and gone . . . so that issue is done, but poor church attendance . . . well, that’s still here. Jim Elliff, the author, began his article with an analogy of a person being asked how he/she was doing. The response was, “Pretty well, under the circumstances.” The circumstances? Well, it’s discovered that the person responding has a paralyzed leg and “from all appearances, the rest is dead. At least it stinks and bits of flesh are always falling off.” Of course, the analogy refers to the Biblical concept of the church as a “body” of believers. So, is the Southern Baptist Church mostly dead? Let me simply restate the sobering statistics as reported by Elliff in 2005 and updated in 2009. Do the math . . . only 38% of the members are attending church. If you are one of the churches that has a Sunday evening service, brace yourself. The numbers show that only about 12.3% of the membership shows up for that service. In Mark Dever’s book, “9 Marks of a Healthy Church” (published in 2000), he wrote, “According to one recent Southern Baptist Convention study, the typical Southern Baptist church has 233 members, only 70 of whom are present at the typical Sunday morning worship service. So, where are the other 163 members? Are they all at home sick, in a rest home, at college or on vacation, or in the military.” Dever continues by asking what is the “spiritual state” of those who haven’t attended church for months or even longer and “what does this convey about Christianity to the world around us?” Just for the record, Dever’s numbers present only 30% of the church showing up for church. To continue with Elliff’s article, he states that 60+% of the church membership not attending church suggests several things. Most of the people on the rolls give little evidence that they love the brethren – a clear sign of being unregenerate (1 John 3:14). Most of those who do not attend (or who only come when it is convenient), are more interested in themselves than God. For further clarification on these three points (of which I agree) please see the article below. In my 20+ years in ministry, the issue of legalism seems to come up more about church attendance than anything else. What is interesting is that if I were to say, “Christians should read the Bible or pray,” most, if not all, would agree. I might even get an “AMEN.” If I were to say, “Christians ought to stay strong in their faith, encourage one another, and stop sinning,” again, I would be affirmed. No one would accuse me of legalism. But if I were to say, “Christians ought to set a day aside, avoid worldly pursuits, join, attend, and serve in the local church . . . LEGALISM is the accusation. Not sure if you caught it but “not neglecting to meet together” is sandwiched between “holding fast to our faith, encourageing one another, and stop deliberately sinning.” So, why are three affirmed and “church attendance” met with the accusation of “legalism?” I think the answer can be found in a question and an observation. First, the question: “Is attending or serving in a church a moral issue and is it an indicator of one’s salvation?” I believe the answer is, “Yes.” Before you take offense to that answer, think for a moment. If your answer is, “No,” upon what authority do you make such a claim? Before I address this, I want to clarify some issues. I don’t believe attendance at every event, every time the church doors are open, is required, nor do I feel it is healthy. The church ministers to different people who have different gifts and callings and are in different phases of life. No one fits into all those categories. The article specifically addresses the Sunday morning worship service and a few references to Sunday night. I am not equating salvation with church attendance. Salvation is by grace alone, in Christ alone, by faith alone. Yes, I am aware that some “check the box” when they attend a worship service while their hearts are far from the Lord. That has no bearing on the present topic. At issue is not the motivation of those attending, but rather “Christians” who joined a church and ARE NOT attending. Legalism is NOT defined by simply following rules/laws. Legalism is adhering to rules/laws believing that one gains favor because of adherence. None is righteous, no, not one (Romans 3:10b). The problem with legalism is that one believes that “righteous actions” are needed in order to save oneself . . . SELF-righteousness. Christians do not obey the Lord in order to be saved/righteous. Christians obey the Lord BECAUSE we are saved/righteous through faith in Christ. I have challenged SCBC (my church) and I would present to you the same challenge. Tomorrow, when you wake up, try to dress yourself without your dominate hand. You will find it quite difficult, if not impossible (good luck with buttons or tucking your shirt in). If we truly are the body (and we are) then when 60%-70% of the body is absent/non-functioning what does that do to the rest of the body? I’ve just mentioned your dominate hand. Imagine your body functioning without 60%-70% of your organs. Good luck with that; and yet, that is what many churches are attempting to do. You see, attending church, growing and being challenged in your faith, ministering to people, and getting your hands dirty as you deal with messy situations, although tough, is not a suggestion . . . it’s a command. Not only are we told, “Don’t neglect to meet together,” we are told that it is “the habit of some.” Simply put, “Don’t get into that habit.” So, if that is what God’s Word says and you find that to be legalistic, I’m very curious . . . what other commands we can simply disregard and dismiss them as legalistic? Here is the other side of missing church. It’s not only tragic for the church, but it’s tragic for the absentee member. If the other 2½ tribes would have failed to go, help their brothers, and engage in battle, they would have missed out on seeing the miracles of the Lord as He went with Israel and before Israel. Can you imagine having to hear about crossing the Jordan or only find out, by word of mouth, the victory over Jericho? The issue is NOT only missing church and failing to help, but being absent and failing to experience (along with the rest of the body) the miraculous works of the Lord. Lastly, I previously stated that the accusation of legalism could be addressed with a question and an observation. You’ve been given the question, but what about the observation? ALL THE WHILE declaring that church attendance is legalistic, is that whereas the first three cannot be definitively observed and noted . . . the last one can. You see, your fellow church members have no idea if you are holding fast to your faith during the six days of the week. They have no idea if you are encouraging others or if you are fleeing from sin, but every seventh day, your attendance, or lack thereof, is recorded. It’s a known quantity. There is accountability . . . and that is troubling if you do not want to be held accountable. “I didn’t know that was in scripture.” You do now. “It doesn’t matter if I’m there.” The body needs all its parts. “It’s tough.” Yep, but so are many other things in life and you stayed the course in regard to those. “Regular church attendance is legalistic.” Not true. It is a command from the Lord, not a way to the Lord. I hope to see you in church on Sunday. I’ll certainly be there. Come and see what the Lord will do in you, through you, and around you.